I’m two weeks overdue on this post, but I really just haven’t had any computer time lately. 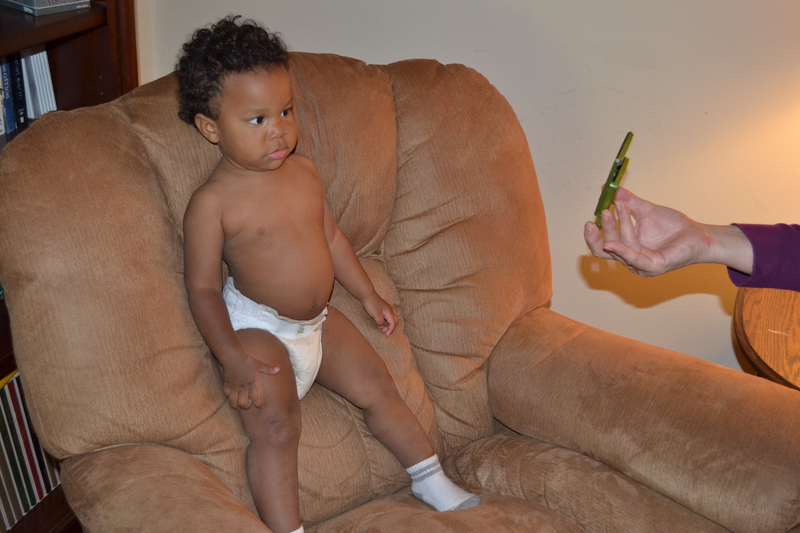 Isaac grew another two inches since his last appointment, and is now 34″ tall. He’s holding steady at 26 lbs, and his head is 47 cm. He stayed at the same percentage on the growth chart for everything except height (which went up, but I can’t remember to what). 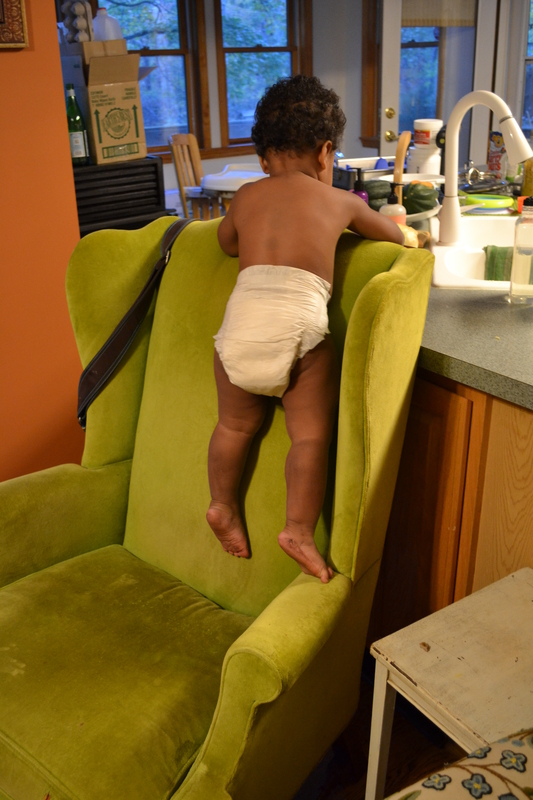 I knew he’d gotten taller, just by seeing what he can now reach around the house. 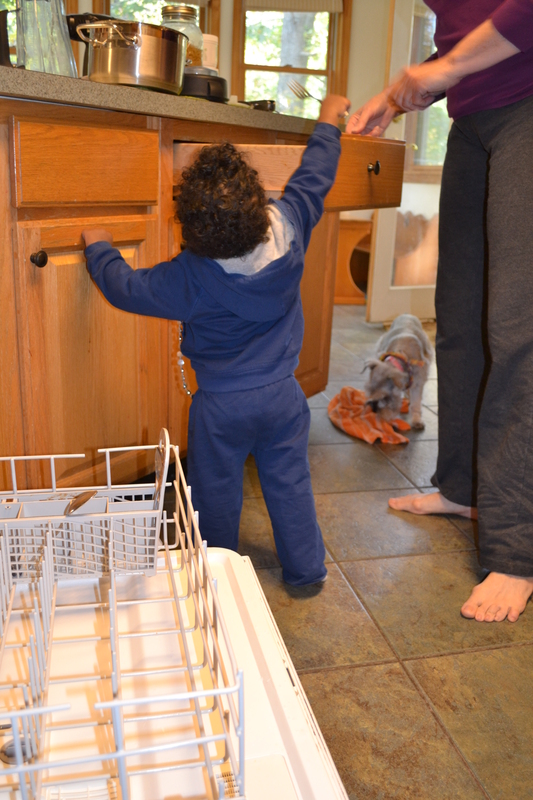 He can pull things off the countertops with ease now, and often grabs my mug of tea (without spilling!) and takes a sip before I can stop him. We’ve had some close calls with pots on the stovetop and with knives left a little too close to the edge of the counter – it’s enough to give Mama a heart attack! Teething has been pretty rough for him lately. He got his four eye teeth in last month after two whole months of pain, and we were hoping for a break before the molars started, but no such luck. All four started bulging immediately, and have just been killing him. One of the little points has broken through on one of his molars, so only 15 left. Ugh. He has his fingers in his mouth constantly, and is pretty clingy during the day. He wants Mama nonstop, and if we can’t distract him by playing outside, things get pretty rough. He is such a happy guy normally, so seeing him have such a rough time teething is really hard. It’s been interrupting his sleep, too, so that’s no fun for anyone. I could nibble those thighs all day long! Our little guy is such a ball of energy these days! He literally does not sit down all day long. 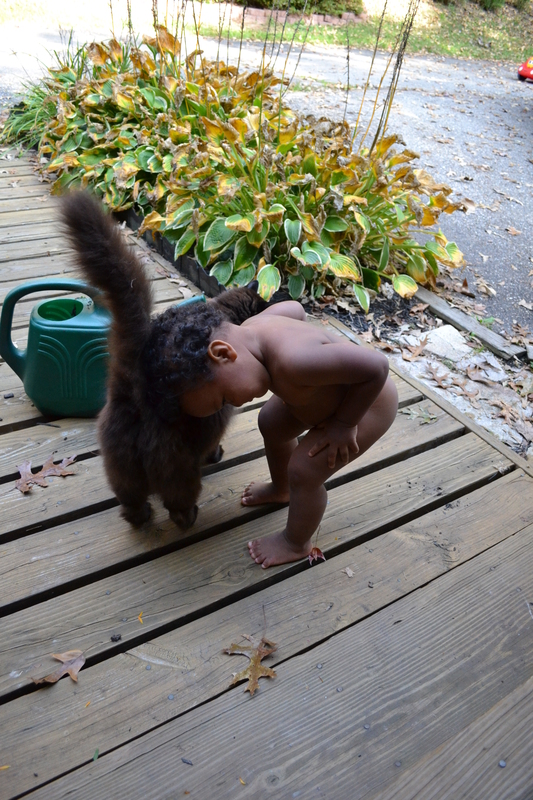 He runs through the house like a little whirlwind, playing with toys, getting into things, chasing the doggies. 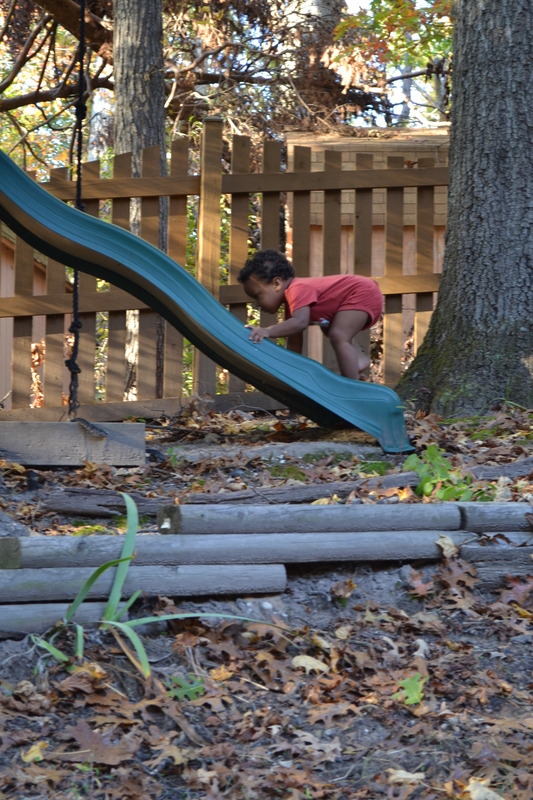 Most of our afternoons are spent outside walking around the neighborhood or just exploring in the yard. Isaac loves listening to the birds chirping, pointing out all the leaves falling, and inspecting every rock, plant and clump of dirt around. 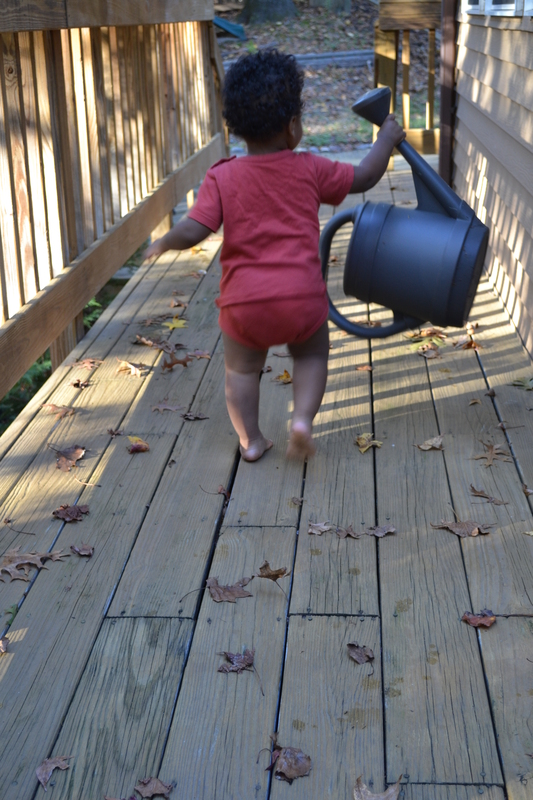 ‘gonna water the plants for you Mama! I can get up this way, right? He is such a social little guy! His love of men continues – he’ll run up to any man and ask to be held or just give their knees a squeeze. On outings to the park, he’ll go around hugging all the dads, making all the other kiddos jealous. He loves being out and about, meeting new people, visiting neighbors or running errands. Someone remarked the other day that he’s either hamming it up for the crowd or he’s completely serious, just taking it all in. It’s true – he tends to be more reserved with giant groups of people (although he was the life of our Halloween party on Saturday! ), or lots of kids his own age. He loves older kids though, and has made friends with most of the young kids and teenagers in our neighborhood. He’s still in love with all dogs. We took him to a fall fest in Annapolis the other weekend, and there were so many dogs there! He was in heaven. When he’d see one, he’d yell “dooooog!” at the top of his lungs, each and every time. And the boy has a set of pipes, haha. He can really yell! He was cracking people up right and left, he was so excited about the doggies. He had to pet them all, and loves hugging them (especially the big dogs). Our little man is just so affectionate! He gives the best hugs – he’s so strong, he can squeeze the stuffing out of you. After his bath, before I put his jammies on and I still have him bundled up in a towel, he will wrap his little arms around my neck and just hang on for a solid two or three minutes, nuzzling into my neck. I could just melt. If you ask him, he’ll give you kisses – with his mouth all puckered up tight – and sometimes out of the blue, he’ll offer them on his own. No matter how busy he is, he’ll always come back to Mama for a cuddle. Isaac is finally interested in stacking things – he’ll make a tower out of his stacking cups, or stack the cans in the pantry. He has very little patience for things he can’t do right away though, and gets frustrated easily. He still loves putting things in other things, and will spend hours gathering all of his toys and piling them in the laundry or toy baskets, or even the wastebasket (which we no longer use for trash, since it spends most of its time as a home for his toys). He knows where things go and will put his books away on their shelf, or put our shoes back in the closet if we leave them lying around. He loves carrying his dirty diapers to the trash can to throw them away. He’s not a neat freak, by any means (I wouldn’t have any idea what to do with one of those anyway, haha), but he does enjoy putting things away almost as much as he likes taking them out. And as I type this, he’s got the rolling pin in his arms that he pulled out of the cabinet yesterday and put in the laundry basket, and is carrying it back to the cabinet and putting it away. Hilarious! Even a day later, he remembers where it came from. He absolutely loves washing his hands. 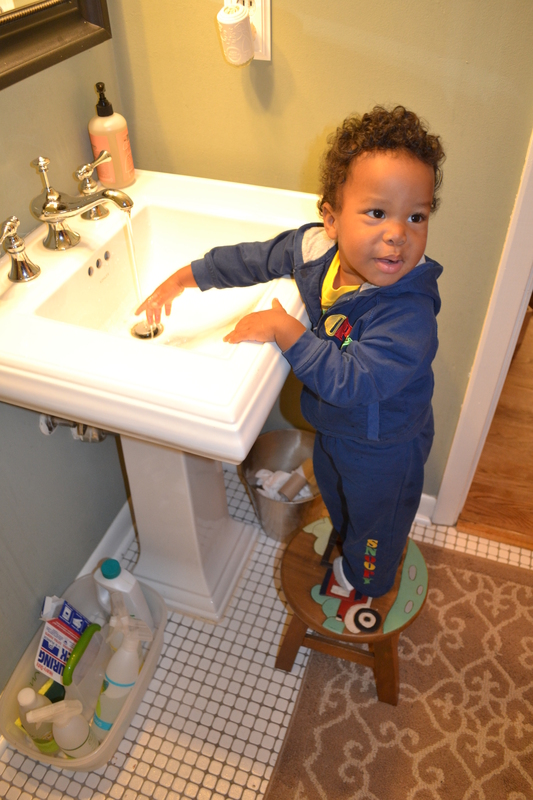 He has a little stool in the bathroom and he can barely reach his little hands under the water, but he gets right up there and asks for water and soap and rubs his little hands together. He knows to hold his hands out for a towel afterward, but most of the time he’ll say and sign “more” – he could wash his hands all day! 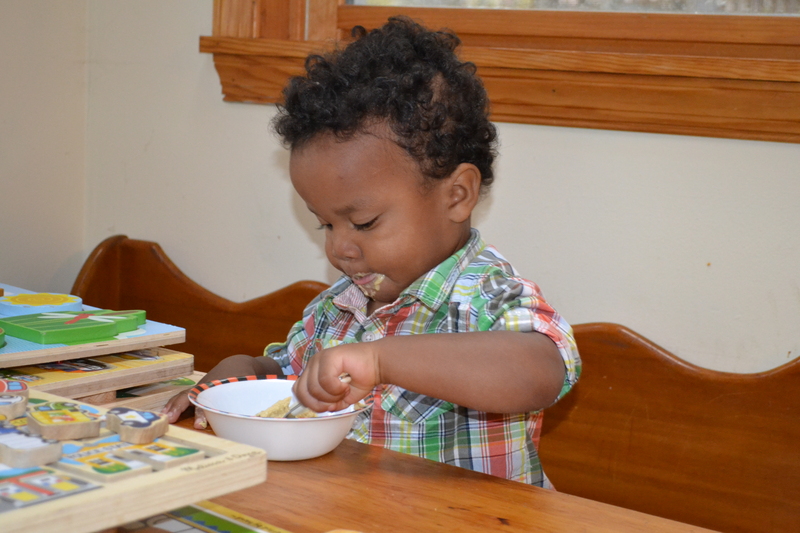 Isaac is still talking up a storm, and adding new words every day. He’s started calling us “Mommy” and “Daddy” instead of Mama and Dada, which I love and hate all at the same time. Love, because it sounds so darn cute…and hate, because man, it makes him seem so old all of sudden. He still mostly cuts all the endings off words, or says only the endings (diaper is still ‘per, and tomato is ‘to, for example). He is such a mimic, repeating everything we say, and enjoys trying to sing along to nursery rhymes. His favorite song to sing along with at the moment is “Row, Row, Row Your Boat”, but “The Itsy Bitsy Spider” is a close second (and he knows all the motions). He understands much more than he say say. He can follow instructions quite well, and listens in to conversation and picks up quite a bit (he especially loves when we talk about him). He’s pretty quick – you rarely have to tell him something twice for him to get it. It’s so hard to convey just how much personality our little guy has, and what he’s really like. I can write his stats, give an anecdote or two, but I just can’t seem to get it right. He is such a sweet little guy, yet so spirited, so adventurous yet cautious, so darn smart. I just love him so much! November 5, 2012 in Isaac.